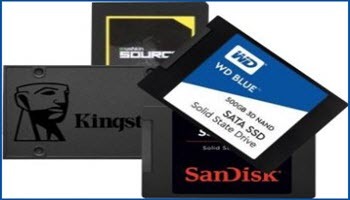 With the price of many premium brands of Solid State Drives (SSDs) nosediving, perhaps it is time to investigate what an SSD can do for you. Upgrading to an SSD can feel like adding an additional 600 HP to your car. I say “feel like” because it just gives you faster access to your data. The longer it takes for a disk to recognize a task, the longer it takes to start a read or write. In the graphics below, the first is a comparison average Read/Write Speed for an HDD on my system against an SSD. 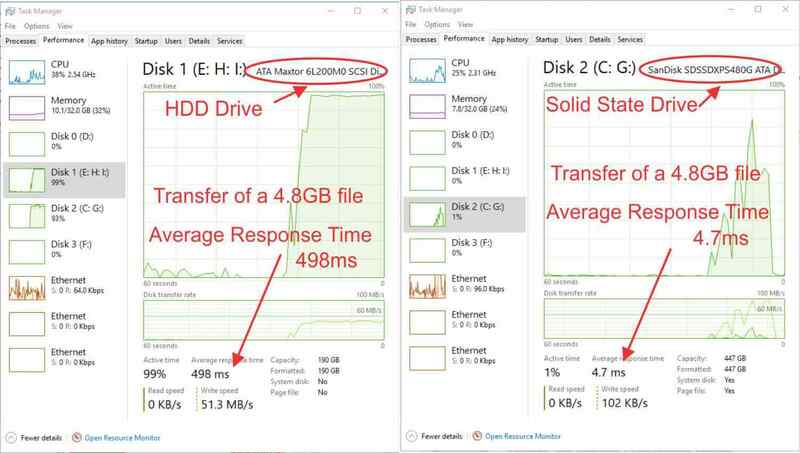 The next graphic was created to measure the transfer of a 4.8GB file and to show the difference in response time. 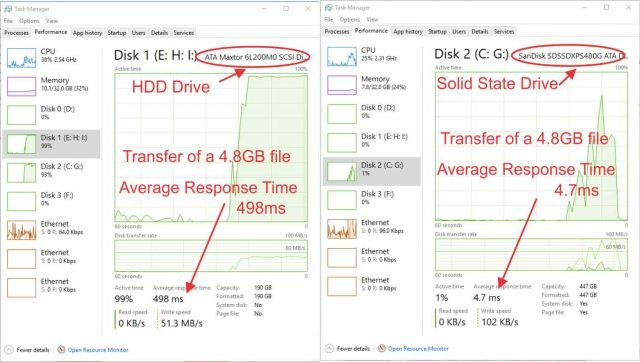 If you have at least 4GB of memory, upgrading to an SSD is the best way to maximize your computer. The price-drops on these drives have been incredible for the typical user. The Zheino SSD runs around 21 cents per GB. It offers a 3D Nand and R/W speeds of 510/440 MBps. It comes with a 3-year warranty. 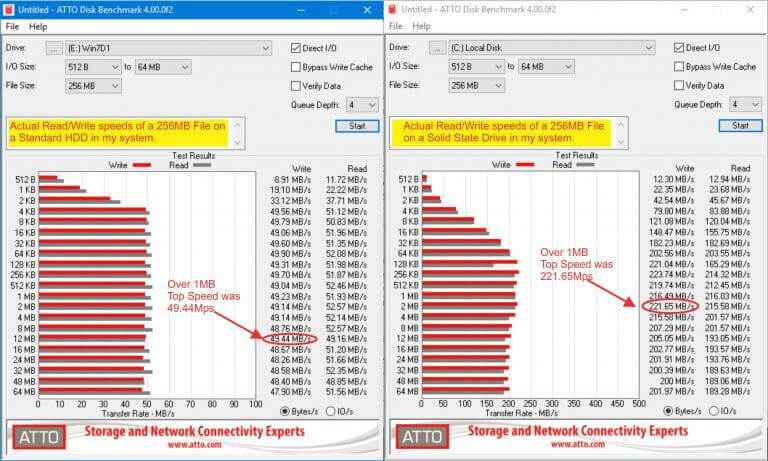 An addlink S20 3D NAND SSD 1TB is only 11 cents per GB and provides sequential R/W up to 560/510 MBps. It comes with a 5-year limited warranty. These are just two examples of many competing drives that sold for 75 cents per GB in 2014. There are some reasons for these price drops but the biggest is the introduction of 3D Vertical NAND. Think of it as building high-rise apartment buildings instead of individual housing on a block. You can increase your capacity without having to increase your area. Higher capacity drives are cheaper which automatically reduces the desirability of low capacity drives making their prices drop accordingly. The technology is a few years old but manufacturers still held on to higher prices. Now the dam is broke and there is no going back. With a one Terabyte Sandisk SSD available for $125 it won’t be long before all new builds will only be delivered with SSDs. Another benefit is life expediency. In the past, there were questions about their reliability and lifespan but honestly, that is just not a problem anymore. The mean time between failure rates has surpassed HDDs with even low-end models advertising 1 billion hours. (that’s 114 years by the way) Higher-end models can top 2 billion. The benefits don’t stop there. They only draw 2-3 watts, about a third of traditional HDDs and they can increase a laptop’s battery life by 30%. SSDs have no moving parts– this produces less noise, and the lower power draw means cooler operation. Typical HDDs have an R/W between 40 and 120 MBps while older HDDs tend to run even slower A fragmented HDD can have very high latency. SSDs, however, have a sequential start R/W of around 500 MBps minimum with expensive models performing even better and with exceptionally fast response time. Even with the higher speeds all around, it is hard to say exactly how much improvement you will have. If your current HDD is performing like new, the new SSD will still show a marked improvement. On the other hand, if your HHD is on its last leg, and you purchase an SSD, you will be amazed. I have not had a single complaint from any of my clients. Every owner has remarked about the “new feel” after the upgrade. Average boot times were between 30-40 seconds before and about 12 seconds after. How do I install it in my system? How do I preserve my existing data and programs? Anything I must do differently, once it is installed? Will it be better to wait until they are cheaper? I believe the price will continue to drop over time, but it is to the manufacturers’ benefit to delay that as they did when 3D VNAND was introduced. However, with the very low cost of SSDs, NOW is the time for just about everyone to upgrade their computer and enjoy the benefits of solid-state storage. When you are talking about 120GB models that cost around $25, there is no good reason to wait until they are $19. There is no doubt that installing an SSD can make your computer feel brand new again. Just having your computer boot up three or four times faster will do that. In Part 2 I will be covering the methods of installation and possible pitfalls. Food for thought: Seagate offers a 15TB SSD that provides sequential performance up to 2.1 GBps. That means that if they can already produce SSDs with performance times four to six times the current personal installations, it is only a matter of time before they are available to everyone. We will just have to wait until their price of $10,000 drops. The following is just for number junkies like myself– Seagate unveiled their 60TB drive four years ago. Only 17 of them are needed to create a Petabyte (PB). If you are interested in numbers and comparisons like I am, this link will show what a zettabyte is and a lot more. Just five Zettabytes can hold all the words ever spoken by human beings? Part 2 of this article will hopefully answer all the technical installation questions you might have. What are your favorite brands? I got the 250 Gig 850 EVO back in June 2015, still 34.3 out of the 75TBW they advertise. Since some games I want to play are a bit big in size, I wanted to go 500 Gigs. The one part where I agree an S.S.D. can benefit the most is booting up the computer and the annoying Windows Updates, my laptop’s H.D.D. takes like 5X the time to install an update versus S.S.D. and the solid state drive in my desktop is crippled with S.A.T.A. 2. My old laptop’s H.D.D. died, so I wanted to swap for an S.S.D. but I am wondering if I can just swap it and no problems? I didn’t remember to disable Secure Boot before the H.D.D. died. Megaman,I don’tknow if I have a favorite brand now. I really like scandisk, their speed and reliability were a big issue when it was installed 4 years ago. (still going strong by the way). But I think that while there are superior brands, on the market today it is one of those things where, a great deal of the less expensive brands are made in the same factory and shipped under different names. And even different brands are put together pretty much the same. Because of the price I have been installing a lot of Kingston drives for my clients, a 120 is only 17.99 on Amason. If I had to install a new one on my machine it probably would be the samsung 850 500gb or Crucial MX500 1TB 3d NAND. As far as replacing your HDD on your laptop, I would use my favorite method, (discussed in next article.) and just place the new SSD into your laptop, download windows media creation tool on another laptop and create a bootable iso file on a usb or CD/DVD. Simply boot from the iso file and have it install windows on your computer. You will have a brand new copy of windows installed. Just remember, you must install the same version (i.e. win 7, or win 10 using the Pro, Home, etc. you had. The licence is already installed in your existing system and will accept the new iso. It is hard to go wrong. If you can access the data from your old drive, you can recover your personal data easily. Ah, thanks for that. I wrote down the Product Key on all my computers, thanks to Magic Jellybean Keyfinder, it saved my hide when I installed an S.S.H.D. in my brother’s computer. Jim, your article(s) are just in time for my upgrade. Finally added 12 meg of ram, to my previous old computer of only 4 meg. Not worth the cost of replacing the motherboard and cpu, but the tech informed me a cheap alternative right now would be to get an SDD. Like you stated, prices are dropping, and I prefer to upgrade than purchase a new computer, Mindblower! Daniel, without a doubt, there are advantages with cloning especially with Linux, a relatively new OS or when I don’t have replacement software but my preferred method is to do a clean install using an iso file. If you have the software and bandwidth for upgrades, you are guaranteed a clean machine. Windows can carry a lot of baggage over time especially with several uninstalls. Why carry that junk over? (Not to say I wouldn’t have a cloned copy for safe keeping. I do a lot of these and find a ton of old unused drivers, Apple and other unused software including bloat ware by the manufacturer. I have checked a couple of registries on machines that were running for 4 or more years and man there is a lot of junk. You have a point Mr Jim. But why do a clean install when the HDD is already running an updated W7 or W8.1. Much quicker than having to reinstall all the Windows Updates and or Software. Both of my SSD were cloned from HDD. I wish it that was true Daniel. Changes over time fragment the registry similar to a HD. A win update does not make that go away. It may check and replace drivers but most of the stuff it does not know if you want so it leaves it alone. If you install several programs and also remove some programs you can bet some bytes are still present after your update. Knowing you, I sure your ahead of the game and cloning is the way to go. Then you have that space hog of “Old Windows”. I have no problem doing fresh reinstalls, all my programs are the cloud and easy to do a fresh install after swaping drives. Then I know, nothing is in my system that I did not Just put there. MB, the ram sure won’t hurt but the new SSD will really fine tune your system. See my answer to Daniel below. If your machine is old and you have your replacement programs a new install might even speed it up further. I have W10 running on a SanDisk 240GB and Linux Mint running on a SanDisk 120GB, both are running very well. If I am moving from a HDD to a SSD, I will do a clone, to keep from installing software, of course this depends on the capacity of the HDD and the SSD. Jim. In your reply to Daniel you mentioned three important points; left over bytes, old windows and a fragmented registry. But what about programs like PrivaZer and Wise Care 365, which remove much of the clutter which is left over and defrag the registry. Do such programs ( and others) not solve the problem? Ask this since I will be replacing my HDD and the thought of doing a full Windows install with all the updates will take hours, and many reboots. Do not mind reinstalling the programs. It is the operating system which consumes time, Mindblower! Yes they do MB, to an extent. But, all you have to do is run one of them and when it is complete run a competing one. It will magically find additional info to remove that the first one missed. A third will find more. I regularly use Revo uninstaller and always use the advanced option to remove any extra registry entries, For this reply, I uninstalled a simple program like Belarc advisor, it had an additional 190 extra entries. If I used Windows to uninstall it, most of them would still hang around. In addition to that I performed a registry scan by hand and found an additional 9 entries. But…. like I mentioned to Daniel, that does not automatically mean cloning to a SSD is a bad Idea. It is not. I am a fan. As a matter of fact, I did two in the last two weeks. Some clients purchased laptops which had HDD’s and wanted to upgrade, the fastest way is to clone, even thought they had not added any thid party software yet. So clone away. Mynext DCT article will cover all methods. I will add, many users on this board don’t have a system as complex or as old as mine (10years old this month) and a complete .iso fresh start takes me less than 1.5 hours. With my internet, it would probably take me 3 or 4 days to do a fresh W8.1 install. Will be looking forward to your next article. Been a good discussion, Thanks. Jim, as I understand it, SSDs have a limited number of rewrites before the sectors/clusters or whatever go bad. It seems to me that a smaller SSD would have parts of its data storage overwritten much more often than a much larger SSD, given the same system. So wouldn’t that infer that a larger SSD might last longer, since the very same data storage places might not be overwritten as often if there is more unused space available? Jack, a number of years ago you might be right but the life expectancy for todays SSD even 120GB is between 1 and 2 billion hours. 1 billion would equal about 13 years. Even high end spinning hard drives would be pushing it to get to 1 billion hours. Like a standard HD a digital hard drive can theoretically break down the day you buy it, but neither are likely. Also keep in mind that HD’s are constantly defragmented and that is not so for SSD’s. To be honest, it is not something I would worry about. Just enjoy the speed. What I do is keep all my own personal files onto cloud storage (e.g. in a dropbox folder). I also have a chocolatey script on dropbox which automatically installs all the apps that I use. I also store any special drivers and other app packages on dropbox. I can reformat and install Windows from an Easy2Boot USB drive with drivers and many apps in 30 minutes. Once logged in to dropbox and it has synchronised, it takes me another 30 minutes to install the other apps. I always use an SSD as my internal hard disk. Even the cheapest one is better than any spinning version because of latency. SSDs are also far more resilient to being dropped when used in a laptop! Steve, sound very efficient. When I worked at corporate level installs we used a similar setup for every new employee. We could do 10 or more installations simultaneously all under 20 min. Of course that was using profession level software and Windows Vista and XP at the time so it did not take long. Right now, I store everything on a 2TB thumb drive that only cost 14 bucks on ebay. I also keep everything I ever had on another two. I test out a lot of OS like Linux distros, most versions of Windows and others so it is nice to have a place to store my iso’s. I think I will take up your suggestions and give chocolatey a spin. I have never used it and it might make a good write-up. Just to be clear, I don’t use disk images or backups. I just reinstall from an unmodified Microsoft Win10 ISO on my Easy2Boot USB drive. It allows me to install Win10 with drivers and chocolatey apps, unattended, in 15-30 minutes (time depends on how many choco apps there are). I NEVER leave my backup drive connected to my PC. If I get caught by ransomware, etc., it will encrypt all the files on my backup drive! The same thing applies when using permanently online synchronised-folder cloud storage. e.g. If your dropbox files go ‘bad’, then all your dropbox files on all your other devices will also turn bad as soon as you boot the systems up! So, I just plug in my backup drive when I remember to make a backup, or I use cloud storage that has a file backup feature like dropbox so I can restore an older version of my files (i.e. ones that have not just been encrypted and synchronised back up onto the cloud server). It is also useful to have a second cloud storage space which does not automatically synchronise files, for occasional cloud ‘backups’. My ‘work’ folder is my DropBox folder. That way I don’t loose any current work should anything bad happen and I don’t have to keep remembering to do backups every day. Yea, I believe I understood your, process in the first comment, thanks. I find the thumb drive just too convient. everything Almost everything I own is on Onedrive as well but I live in a rural area with very good bandwidth but questionable up time. the last electrial storm that had the potential to damage my data was in 1979. I know that because it never happen does not mean it can’t but my redundency keeps me safe, However, a valid point for individuals that are not using a UPS. What great timing for me about SSD’s. Recently my Samsung 840 Pro x 256GB died in my desktop pc a week after my 5-year warranty expired. It’s as dead as a dodo unfortunately, even after mounting it externally to my laptop. The laptop can see it but I cannot access anything on it at all. I’m patiently (very) waiting on Samsung to approve a replacement drive under warranty but I won’t hold my breath. The SSD died without warning, I logged off at night as per usual, and when I tried to log on in the morning there was nothing and it kept booting into bios. Moral of the story for me was I never did any backups as it always confused me on what and how exactly I should be backing up? Glad to hear that John. My next article will explain three different ways to perform a back up but Richard, our editor helped clear upsome of the confusion back in 2013 with his article “Backups, Ideas and Opinions” https://davescomputertips.com/backups-ideas-and-opinions/ In December, I also addressed using Windows built in File History Utility that I recommend everyone use. It does all the work as frequently as you wish and will continue to keep additional backups untill space runs out. That is why I us a 2tb thumb drive stuck in the back of my desk top. Thanks for the reply and that article on backing up (I really need to get my head around it)? I’m still (very) patiently waiting for a reply from Samsung with regards to my warranty for the SDD which I lodged on the 1/1/19. I look forward to your next article on backing up.